How does your family start their day? Do they wake up and run out the door or do they take a few minutes to eat breakfast? As the mom, I have always been a firm believer of everyone eating in the morning. I have taught my family that breakfast is to "break" the all night "fast" and necessary for their body to function all morning long. Besides teaching this I have always had breakfast options available for them to choose from each morning. I'm all for wholesome and simple. How about you? One of the food choices that I always have in the pantry is cereal. Everyone has an old standby favorite but we all like variety so what we have in the pantry does vary. I'm ONE OF THOSE moms who will buy everyone their own box of cereal. I buy them what they want to eat. We were sent 5 boxes of our most favorite family brands of cereal, Kellogg. Their cereal serves as a reminder that breakfast time is a time to "Start Simple Start Right" which has always been my belief for my family. So which cereals were we sent? Here they are along with our thoughts on the cereal, who likes them and what I do with them beides eating in the morning. *Kellogg's Raisin Bran- This is mine and daughter #2's favorite. As a teen she is the only one who likes raisins in her cereal. Daughter #1 will eat raisins, just not in her cereal. I use it when baking bread or making muffins. *Kellogg's All Bran- I'm the only one who likes to eat this cereal. I like to add it to yogurt or eat it with a banana. I do bake with it, too so then everyone eats it! It is a win-win for all when I bake with it. *Kellogg's Corn Flakes-Hubby has always liked this cereal and does add honey to it. The girls will eat it, too. We have a family favorite cookie recipe which everyone loves. They even try and convince me that the cookie is breakfast food. I will also use as a crunchy topping to coat fish and chicken when I'm going to bake them in the oven. *Kellogg's Rice Krispies Original-Everyone loves this snap, crackle and pop cereal! Great for yummy Rice Krispies bars. *Kellogg's Rice Krispies Gluten Free -This is a first large box here and well received! I had a sample once and liked it! We couldn't taste any difference from the original. Great for dessert making, too! Check out this informative graphic on Kellogg's Seed-To-Spoon process (click to get more information.) It is very educational! My kids love where our food comes from and how our favorite brands get it to our table. How about yours? We wish that we could visit every factory but of course that isn't possible. 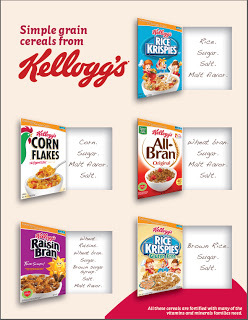 Out of the five that Kellogg cereals that we tried, do you have a favorite? How about your family? How do you get your family to Start Simple, Start Right? I'd love to know! Please share what you do below. I participated in a campaign on behalf of Mom CentralConsulting for Kellogg’s. I received sample products to facilitate my review as well as a promotional item as a thank-you for participating.